Designed by Elsa Schiaparelli, French (born Italy), 1890 - 1973. Designed in collaboration with Jean Cocteau, French, 1889 - 1963. Embroidered by Lesage, Paris, founded 1922. Schiaparelli’s close friendship with Jean Cocteau led to his making two drawings for her, which she used in her fall 1937 collection. Cocteau’s extraordinary ability to create form by the use of a single line is evident in these designs, translated into embroidery by the firm of Lesage. 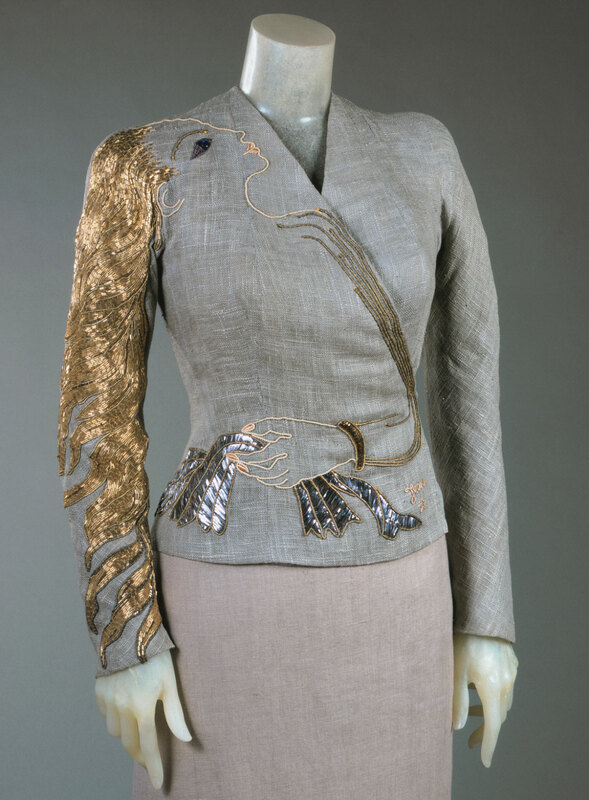 This Cocteau design, on the gray linen jacket of a dinner ensemble, is of a woman’s head in profile with long golden hair flowing down one of the jacket sleeves. Schiaparelli’s collaborations with Cocteau included supplying costumes for the actress Jany Holt for Cocteau’s play Les Monstres sacrés (The Holy Terrors) in 1940 and for actress Maria Casarès in Robert Bresson’s film Les Dames du Bois de Boulogne (The Ladies of the Park), with dialogue by Bresson and Cocteau, in 1945. Dilys E. Blum, from Shocking! The Art and Fashion of Elsa Schiaparelli (2003), p. 140.